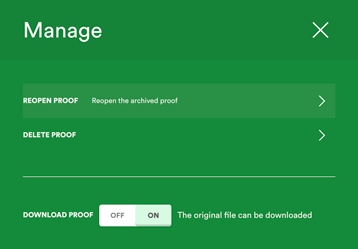 As the proof owner, if a proof was put on hold, or closed and archived off everyone’s dashboard inbox, and now you’d like to reopen the proof to where it was last left off, you can. When the proof is reopened it will be seen in the inbox or sent area of the dashboard depending on the proof’s status. Search for the proof on your dashboard. On the proof tile click the cog icon to open the manage proof pane. Select reopen proof and click yes, reopen to confirm.